First of all, we’re not done with this case file. We keep rereading it to figure out who the guilty person is. Anyway, it all started when- scratch that, I have no idea when this happened- when there was this new kid here named Dan. He read the newspaper about our rebellion against FunTime, so he made his own little cootie-catcher: the Fortune Clone-trooper! For short, we call it the FCL, or the Clone-trooper. He introduced himself, and at lunch, he introduced the FCL. “Yeah, well, this might have good advice, but the Fortune Wookiee’s advice is better!”, said Tommy. “Hey, chill out, dude! You just met the guy. You haven’t even gotten one fortune from it yet.”, I said. “OK, I’ll ask it a question, I guess. FCL, I’m bored. What should I do?”, he asked. “Pick one of these options.”, Dan said. “Right helmet, left helmet, left arch, or right arch.” “Huh?” you can tell that he was pretty confused by his options. “Right helmet means the right section of his helmet, left helmet means the left section of his helmet, left arch means the left part of that arch at the bottom, and right arch means the right part of the arch on the bottom”, said Dan. Chapter 2: by Sara: Immediately after that, the lights went out. Nobody could even see. All of a sudden, I heard someone running. And then someone took the Fortune Wookiee! It sounded like paper being thrown, so I think that someone put the FW somewhere that we kids are not allowed to go to or something. Then, I heard more footsteps, and the lights turned back on! When people saw me without the Fortune Wookiee, they were shocked. And that’s when me, Tommy, Kellen, and a bunch of other kids got together to solve this mystery. At computers class, we had free time, so Kellen googled “SPL”. my name is Tommy, and believe it or not, I’m the Tommy from the case files with Origami Yoda in them, which you’ve probably read. 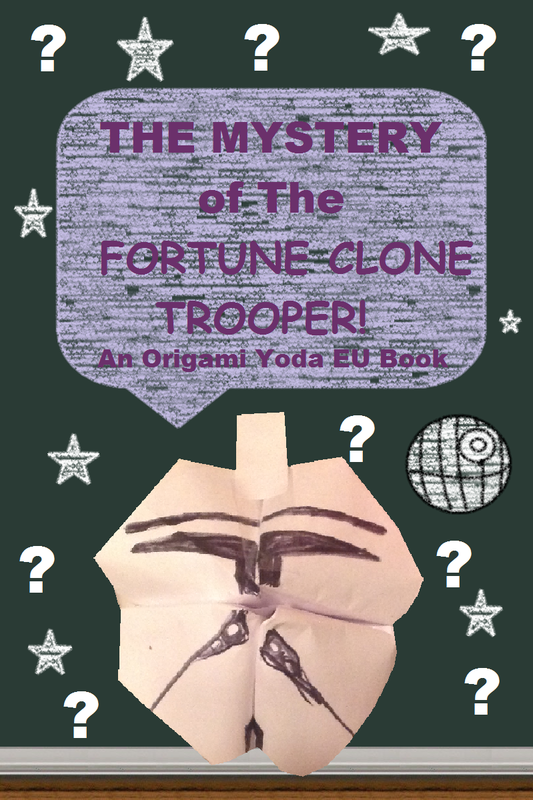 There’s this new kid at our school named Dan who heard about our case files, and made an origami clone-trooper in the form of a cootie catcher, and at lunch, the lights went out, and someone stole the Fortune Wookiee from Sara! We need your help to figure out who did it. If you have any questions, just ask. Please help us! “OK, we need a full telling of what happened from Sara. So I ema- never mind, you’re probably getting bored of reading emails. So I told them everything. They said we should try to borrow the FCL from him as evidence, despite the fact that it might not work. The next day was kind of like a disturbance in the Force for us, and at lunch, Harvey was telling us about how cool the FCL is. “But it’s a clone-trooper. And you’re a guy with the Darth Paper, and Darth Vader is in the Empire. The clone-troopers are for Jedi, so if you’re gonna be an Imperial guy, you should be going for a Stormtrooper. They changed it from Clone-trooper to Stormtrooper during Order 66.”, said Tommy. I was so tired of Harvey, I did something I regretted 2 seconds later. All I did was try to elbow him, but I accidentally threw my pizza slice at him! “LOOKS LIKE THERE’S A FOOD FIGHT!”, he yelled. I couldn’t believe it. I had accidentally started a food fight, but at least Tommy, Kellen, Rhondella, and Amy knew it was an accident, since they were at my table. Since food was flying everywhere, the adults couldn’t pinpoint who was involved during most of it, so I figured I wouldn’t get it any more trouble if I threw anymore food, so I decided to throw some more food at Harvey. But you won’t believe what happened next! Harvey the tattle-tale: by Tommy: Just at that exact moment, one of the most evil people ever, Mrs. Rabbski, came in. “WHO STARTED THIS FOOD FIGHT?”, she yelled. Everybody froze. Sara was really scared. “SHE DID! SHE DID!”, Harvey yelled as he pointed to Sara. “SHE THREW FOOD AT EVERY SINGLE PERSON IN THE CAFETERIA!”. Sara would’ve probably crumpled up his Darth Paper if Principal Rabbski wasn’t there. Not only that, but Harvey decided to be even MORE of a smart-aleck, so he then said that me, Kellen, Rhondella, and Amy joined together with Sara, so he basically said that everybody at our table other than himself started it. Which is a total lie! So that’s how we all ended up in the office. Luckily, my parents thought that Harvey’s accusation was totally ridiculous, so at least I didn’t get grounded or anything. Plus, Kellen’s, Rhondella’s, Amy’s, and Sara’s parents all said the same things to them, according to the emails they sent me. But anyway, the next day, we asked Dan if we could borrow the FCL. But instead of saying yes, he just said, “As if I would lend it to the people who started a food fight!”. “You actually think that Harvey was telling the truth? You’re crazy!” said Kellen. “You people are the crazy ones, considering you actually thought that getting the FCL would be good evidence as to solve who stole that Fortune Wookiee of yours.” “HOW DID YOU KNOW?”, I said. “I’m not saying I asked the FCL, but I asked the FCL.”, he responded. So that’s our explanation if anyone asks how we lost our evidence. That’s our case file so far. I know we don’t have much, but we’re gonna put more in it to figure out who did it. Heck, this might go on for months for all I know. I really have no idea how long it is until we get more evidence… if we get anymore at all. “A food fight?! I already knew Harvey was trouble, but seriously?! OK, you’re gonna need to figure out a way to get the FCL without Dan’s approval. So our advice is that you just randomly steal it from him at lunch. “How the heck are we supposed to do that?”, I responded via email. “If you really need help, we’ll send a representative to help you guys out. His name is Sam. He has folded an Origami Lando Calrissian, so that you know it’s him. “Awesome! Can’t wait,” I emailed them. We had no idea what to do next. And when we don’t know what to do, there’s only one hope left: Origami Yoda. I was sitting in math class, when I felt someone tap on my shoulder. I turned around, and saw the most beautiful girl. Her dark brown hair almost covered her freckle-specked face, and whatever the hair didn’t cover was blocked out by reading glasses. She wore a freshly-picked flower in her hair, and smelled like the springtime. “May I please—if I’m not intruding—borrow a pencil? I lost mine.” Her voice sounded somewhat raspy, but I came to learn that this was just how she normally talked. It was kind of cute. I realized I had been staring at her. “Oh! Um, well sure!” I handed her a neatly sharpened no. 2 pencil. Her eyes lit up. I blushed. Realizing I had a manly image to uphold, I snapped out of it and turned back around, to face Mr. Weinger. Dan burst through the door, lugging his backpack behind him. “Sorry I’m late,” he sat down in the seat to my left, next to me. We’d sorta become friends lately. It was actually kinda cool hanging out with him. Sam was sitting in the seat to my right. He kept looking at Dan, expecting something to happen. The lights shut off for a few minutes. I felt my chair get pushed around a bit. Then the lights came back on. Dan was gone, and so was my Darth Paper. “Arrgh! Why do I never get a best friend who sticks with me? !” I cried out to anyone who’d listen. Well, with Fortune Wookiee, Fortune Clone, and Darth Paper all gone, I decided to take protective measures. So, I locked all the Origami Rebel Alliance puppets in my locker, safe and sound. I ran to my locker, to make sure all the other puppets were still safe. Phew. They were all safe as usual. I went back to Dwight, who had folded an Emergency Yoda, just in case. “A Bad Feeling About This, I have.” E-Z Yoda said. Dan walked past us, and looked worried. He kept staring at Sam. Suddenly, Sam turned around, and held down Dan. “Alright, kid! Where’s the puppets? !” He yelled. Sam reached into Dan’s pocket, and pulled out none other than Origami Yoda. Sam stood up, keeping a hold on Dan. “The SPL will take it from here. Thank you, Tommy. This wouldn’t have been possible without you.” He tossed Foldy-Wan Kenobi at Tommy, after pulling it from Dan’s backpack. Later that day, our finger puppets were found taped to our lockers. The SPL had saved the day! Things were pretty quiet after that. Dan didn’t bother us. Harvey was in love. Everything seemed normal. But nothing stays normal at McQuarrie for long. One day, me, Kellen, Sara, and Remi were all sitting at a table in the library, when Remi spotted something. “Oh my gosh, is that Harvey? !” She pointed towards the table in the corner. Harvey was sniffling, holding a big box of tissues in his hand. We went up to him. “Isabel…..” He choked back tears. He babbled for a bit. I couldn’t understand him. Kellen and I just shrugged. “What? What happened?” Kellen said. “Girls understand this stuff,” Sara sat down next to Harvey. Remi sat on the opposite side. Long story short, she dissed him. I bolted. Running out of the library, I made my way down the halls, searching for Isabel. I saw her, sitting in a spinny-chair in an empty school room, holding Darth Paper in her hands. She looked startled. I ran over to her, but she kicked her legs against the teacher’s desk and rolled past me. She started running out of the room, when Kellen blocked the door. “Okay, think about this for a second. The origami finger puppets were disappearing. The Fortune Clone’s advice mentioned the SPL. We looked it up, emailed them, and we got Sam to help us solve the mystery. “Then, Harvey sat in between Dan, Isabel, and Sam, and Dan left after the lights turned off. Everybody else was still there. After that, it was Sam who told us that Kellen’s locker was left open. And it was Sam who got Yoda and Foldy-Wan from Dan. “What if I did it?” Sam stood at the door. He had changed his sunglasses to a darker red pair. He was frowning. “Misdirection. You never saw me coming, did you?” He smirked. Someone lunged at Sam, and held him to the ground. Dan. “Somebody WAS inspired by them!” He said. “Oh, well, I guess that’s kind of my username, but….you get the point.” He carried Sam away. Later, we talked to Dan/Eggbert. He basically told us that Jango Fortune was made to protect us. To lead us to find the culprit behind the origami kidnappings. Apparently, the sixth and seventh graders also were having their origami characters stolen, besides us. And when Eggbert came to help, Sam hacked his SPL email, and pretended to be an undercover guy. Now, I can confidently say that this mystery is solved, AND that we had made a new friend in Eggbert/Dan. Oh, and I almost forgot. Harvey and Isabel are totally cool now. After taking that small break to cool down, Harvey’s more calm than ever! Harvey’s Comment: But I’m still gonna comment on the case files! You’ll never be rid of me! Haha! Harvey’s Other Comment: Sigh……Yes, ma’am. Tommy’s Comment: Oh, I’m gonna enjoy this! Thanks! Have you read the part from Sara’s point of view yet? Also, for the record, I’m calling it the FCL despite the fact that the last part starts with a T, because CL is short for “clone”. Just wanted to clear that up. That can be arranged! No problem! 😀 The next chapter shall come soon. It’s OK, I don’t watch pewdiepie, but we’re all entitled to our own opinions. I don’t wanna start a fan war. WHAT THE FETT?!?!?! HOW DID YOU WRITE A STORY THAT GOOD?!?!?! MORE CHAPTERS PLEASE!!!!! It’s a cliffhanger. In other words, I will write more chapters, but not for a while. But I will write more chapters for a fact. Wow, this is amazing! You tie in a lot, and make it fit in perfectly with the books! Well done! This is a perfect candidate for the OY EU Book! I can swing my sword, sword. Great job in the twist of the identity of the culprit. But Harvey is the one that’s a Star Wars geek,not Tommy. Hey JC, why did you put me in this? Not that I have a problem, I’m just curious. the last comments where funny! Harvey is the SW geek, not Tommy. No offense. This is my favorite OYEU story so far.